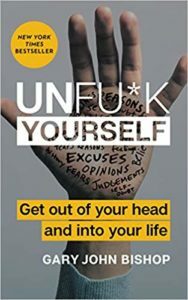 UNFU*K YOURSELF: Get our of your head and into your life. The Premise: Gary John Bishop’s UnFu*k Yourself is the wake-up call for those who are poised to take the next big leap in their lives – personal, career or otherwise, but feel stuck. Bishop is a best selling author and coach who has worked with people in all walks of life and wants us all to get out of our own ways and into our lives. The book, well-written in an easy, down-to-earth manner is really a ‘kick in the pants’ in an easily digestible form. Bishop’s work is based on his ‘urban philosophy’ – “real world answers for real people to use in their real lives.” Through his work, he challenges people’s perspectives about what’s not working in their lives and their ability to change. And this isn’t a thousand page monster of a book that requires tons of your free time. I read this in a couple of hours on a Saturday, but I definitely made a ton of notes and highlighted many passages – this book makes it’s points well and often. With many examples of problems in various areas of life, one would be hard-pressed not to relate. I’m going to keep it close by for reference. The Bottomline: Is there some part of your life that you are unsatisfied with? Bishop maintains that the real problem with our lives lies between our ears. The book opens by outlining how we spend way too much time thinking about what’s wrong and not actually acting in ways to change what’s not working in our lives. He gives us the benefit of the doubt that we all know inherently what’s making us miserable – but he asserts we are just too stuck in our heads to do anything about it. We allow ourselves to be victims of our circumstances. In order to make his point stick, Bishop lays out 7 assertions to shake us out of the ‘thinking’ and getting us into the ‘doing.’ All SO good. So many good quotes in this book that are so easy to apply. From ‘I am willing’, to ‘I expect nothing and accept everything’ Bishops assertions will knock down any attempt of your brain/stream of consciousness to counter what you really want to achieve in your life or career. Do you want to change? You have to actually change. Stop thinking and start doing. Roundtable recommendation: I really did feel that ‘kick in the pants’ when I finished the book. Leaders looking to switch things up and get moving will really enjoy the no-BS approach and the easy, actionable suggestions.